CARROT BAY, Tortola, VI – The Carrot Bay Cultural Fiesta was filled with an air of celebration and bacchanal as a massive crowd celebrated with VIBE on their becoming the new Road March champions and with Machel Montano and his HD dancers capping off the night. The crowd was one that was extensive as was expected at Carrot Bay and while many enjoyed the live performances of Xtreme reunion and the Prime Time Band the true the party got into high definition mode as VIBE took to the stage popping champagne and full of energy as they were introduced by DJ Dre and DJ Push Pop as the new Road March Champions. One of the lead singers for the band showered his fans with praise for their support as they had loved their music especially those of their first album under the brand VIBE. “This couldn’t happen for us without you and we say thanks, we love you,” he said as he also thanked their marketing team and others. 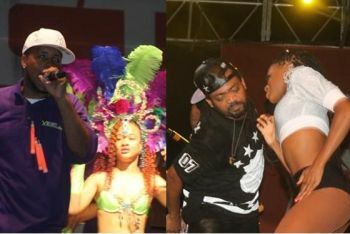 With VIBE setting the pace the crowd was on fire as Machel Montano and his new HD dancers flooded the stage as it was time to Bacchanal in the true carnival style. Prancing from side to side on the stage and never losing that familiar routine, Machel Montano had the crowd pumping. The HD dancers also delivered as promised and Farmer Nappy and Patrice Roberts who were also part of the Trinidad and Tobago contingent delivered no less than expected as they joined with the dancers and Montano. The night ended with patrons calling for more as the sun was beginning to burst the clouds. Absolutely the best night yet! Now this is what we should have performing for our festival. High energy from our locals and guest artists. The night was the best of the whole festival. Not like the J.A them bring in, in East End. What a joke.